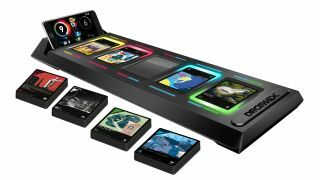 If Magic: the Gathering doesn’t have enough sick beats for you, Hasbro is teaming up with Harmonix, the creators of Rock Band and Dance Central, to introduce a new collectible card game that has you combining tracks from your favorite songs to outscore your opponent. The game is divided into three parts: collectible physical cards, a game board that has the ability to read what the cards are and a mobile app that provides the soundtrack for the game and the scoreboard that keeps tally for you. Each card represents a different part from one of your favorite songs – like the lyrics from Bruno Mars’ “24k Magic” or the bass from Meghan Trainor’s “All About That Bass” – that can be combined to create weird, wonderful mixes which then play from the mobile app. There are five types of parts (bass, beat, loop and lead, plus a dynamic wildcard) and span different genres like Pop, R&B, Dance, Indie, Rock and Hip-Hop. The cards also have points values on them, which are important as the goal of the game is to outscore your opponent by replacing lower-value cards on the board with higher-level cards from your hand, which then begets you points and alters the mix of the song. The cards sync to the game board using NFC, which is then transmitted to the app. Should you want to do like John Lennon did and fly solo for awhile, the game allows for that, too, allowing you to mix and match cards on the game board to your heart’s content. While the game section sounds a bit basic, the idea of mixing and matching parts of our favorite songs sounds incredibly enticing. Add to that the ridiculously cool artwork on the cards themselves, and this sounds like a real Grammy-winning combination. Hasbro and Harmonix say that the game board, cards and app will be available in September of this year and that they plan on selling a starter pack with the board and 60 cards for $100 (around £80, AU$130). Should you want additional cards, Hasbro will release Playlist Packs with 16 Dropmix cards for the suggested retail price of $14.99 and Discover Packs with five Dropmix cards for the suggested retail price of $4.99. Those attending the SXSW festival this weekend will be able to check out the game firsthand on Sunday, March 12.